Médecins Sans Frontières is deeply concerned by the ongoing inability to access healthcare and humanitarian assistance for tens of thousands of people displaced across the country. Warring parties must ensure immediate access for populations, particularly in certain affected areas around Leer, Wau and the Equatorias. Thousands of people in desperate need are unable to access medical and humanitarian assistance due to ongoing fighting. While our teams continue to treat 60,000 patients per month across the country, ongoing insecurity is causing a significant decline in access to healthcare for tens of thousands more people who are in dire need. In recent weeks, fighting around Wau, Leer and parts of the Equatorias has affected the ability of thousands of people to access much needed medical and humanitarian assistance. For many, the ongoing violence and risk of attack means that they are often too afraid to seek help. In addition, the recent surge in fighting has led to a number of NGO’s reducing their staff and projects or even evacuating completely, further limiting the support available to these populations. After 35 years in South Sudan, Médecins Sans Frontières has observed a deterioration of respect for international humanitarian law and the protections it affords the population, medical facilities and its freedom to operate unhindered and untargeted. 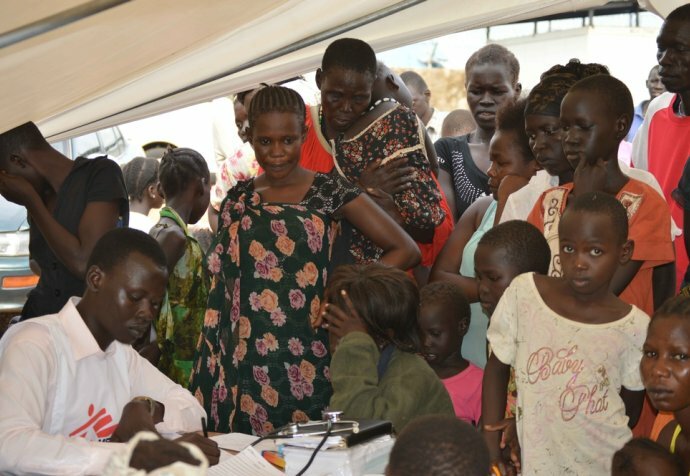 Two Médecins Sans Frontières clinics were destroyed during the fighting in Greater Upper Nile region four weeks ago, with the violence forcing the population to flee and leaving the area without any access to a medical clinic or hospital. Given the need for people to access healthcare and humanitarian support, all parties must ensure the free movement of civilians and access for humanitarian organisations to those affected. At present, the levels of access to humanitarian assistance including healthcare, food, water and shelter is near non-existent in some of the worst-affected areas. Tens of thousands of displaced people in Wau, Leer and the Equatorias are suffering largely out of sight as we and other humanitarian actors are unable to reach them. The impact that this is having on the population is further exacerbated by increased levels of disease, including Malaria. Médecins Sans Frontières remains strongly committed to the South Sudanese people, its partnership with the health authorities and continuing to provide medical and humanitarian support where it is needed most. Our priority is to demand that those involved in the fighting allow Médecins Sans Frontières and other NGOs access so that we can determine the needs and provide the most appropriate response.